Day 25 – 275.6 lbs | I want to be different, just like everybody else. Today was a good day. In fact, I had a great weekend. Zoey came and visited even though Sean was here and best of all, she was actually beyond nice, she was pleasant. We went to Wal-Mart yesterday so I could get cat food and litter and she would be the muscle (since I’m not allowed lifting anything). Today we did some laundry and picked up her friend. I had a good day. I managed to cook pasta for the girls and not eat any of it. Don’t get me wrong, it was hard. It smelled delicious so I had Zoey come and help me by distracting me while I dished it out. This won’t normally be a problem because Sean can cook for himself, but Zoey had a friend over so I didn’t think it would be the best time to start teaching her to cook for herself. Other than laundry I didn’t do much. Which was good because I think I might have pulled something yesterday pushing the buggy at the store. My tummy hurts a bit when I move sideways or stand up from a sitting position. The brusing looks like its going down and I haven’t split any of my incisions so that’s good. I’m also able to sleep on my side again which is great because I’m a side sleeper and having all that gas was horrible. I still have gas today. It’s especially bad every time I eat. So I figure that’s my new full feeling. When I feel like I need to burp but can’t it means I’m full. I’m a bit farty and Sean thought it was hilarious that I farted with him in earshot. I didn’t really mean to but I needed to. It didn’t smell or anything but he still laughed. It’s a new step in our relationship, LOL. My incision pain is next to nothing. It’s more like a pulled muscle feeling along with the gas pain. I ate all my protein today, but I didn’t manage to get all my water in 😦 I’ll have to try again tomorrow and keep better track. I managed to set the alarm on my pedometer so I’m going to be reminded to take my vitamins. I completely forgot about the Prevacid, so I took it out and put it at eye level in the kitchen. I still don’t have to take the needles with the blood thinners in them which rocks because I still have a painful bruise on each thigh from the ones they gave me in the hospital. I’m not feeling any side effects yet. Not drowsy, or lethargic. I feel pretty good. Wish the pain would go away so I could get back to living life and getting skinny. I keep looking over my food lists trying to memorize when I can eat certain foods because inevitably that’s what people are asking when they talk to me. Most people seem completely blown away about what I’m doing. But the truth is, what would you do to save your life? Because that’s what I’m doing – I’m saving my life. Already my diabetes is under control and my sugars are all normal. I have attached a picture of my surgical incisions. 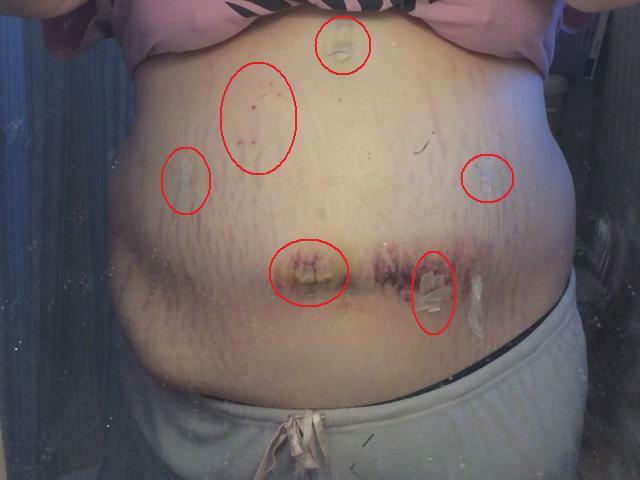 I’m under the impression not everyones are in the same places because I had had 2 previous laparoscopic surgeries but the marks that are circled are where the incisions are. The other marks are either stretch marks or marks on the mirror LOL. I am so proud of you! You absolutely go, girl!